Topical issues of bilateral strategic cooperation in the political-diplomatic, trade, economic, cultural and humanitarian areas were discussed during the talks in Ashgabat by the heads of foreign ministries of Turkmenistan and the Russian Federation, the website of the Foreign Ministry of Turkmenistan reports. During the talks, the Minister of Foreign Affairs of Turkmenistan, Rashid Meredov, and the Minister of Foreign Affairs of the Russian Federation, Sergey Lavrov, discussed the strengthening of cooperation in the fields of energy, transport, communications, scientific, educational and sports ties. The issues of the international agenda, development of cooperation between the two countries in the framework of the UN and other international structures were discussed. In this context, special attention was paid to the topic of cooperation within the framework of the CIS, taking into account the priorities of Turkmenistan’s chairmanship in this organization in 2019. The sides discussed the interaction of the two countries on the Caspian issues, the implementation of the decisions taken at the summits of the Caspian states, and outlined the priority areas of cooperation on these issues for the future, taking into account the support of the Russian side for Turkmenistan’s initiative to organize the first Caspian economic forum Avaza national tourist zone, as well as the decision to hold the Sixth Caspian Summit in Turkmenistan. At the end of the talks, the foreign ministers of the two countries signed a program of cooperation between the Ministries of Foreign Affairs of Turkmenistan and the Russian Federation for 2019-2020. 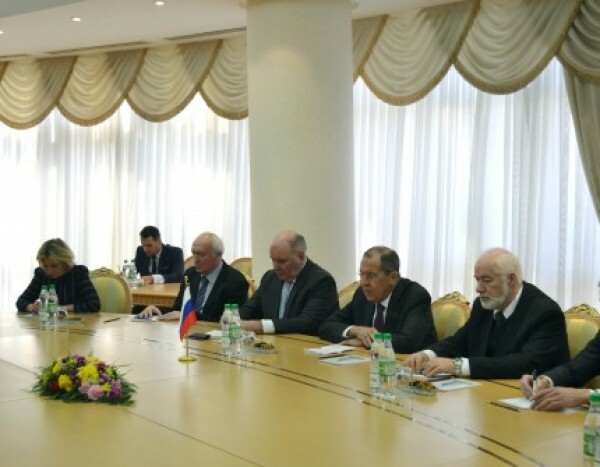 During the working visit, the Minister of Foreign Affairs of the Russian Federation S. Lavrov gave a lecture at the Institute of International Relations of the Ministry of Foreign Affairs of Turkmenistan.